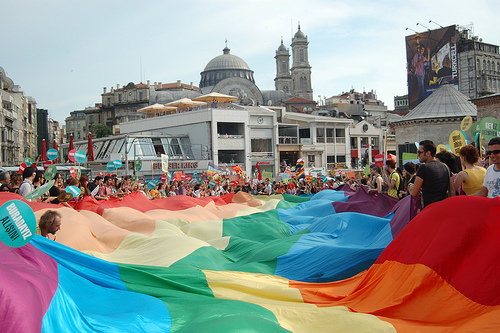 The gay pride parade in Istanbul was not like what you would see in New York or Chicago. It wasn’t subdued, but there weren’t any men in G-strings making out with each other. As a matter of fact, there were almost no PDAs at all. It was more a civil rights demonstration, a political protest, then a “We’re gay and proud and let me prove it to you” kind of gathering. I was late, so I had to get past the anti-gay people protesting the parade first. Then there was a group that seemed somber, and they carried pictures of a gay man that had been murdered in Istanbul the year before. They shouted slogans. I kept going. It looked like more fun up ahead. I was there to start researching a story about Istanbul’s gay scene, but I wanted to stop being an impartial journalist and just go have fun. My brother was behind me with a camera, doing his job and getting a lot of footage. It was awesome, because we were going to have a lot of footage, but it sucked, because I had this irrepressible urge to go get wild in the crowd. About 600 people and 100 meters up, we hit the jackpot. A samba drum corps was flat out raging in the crowd. People waived rainbow flags and danced around like maniacs. Few touched each other, but they were still letting loose to awesome and funky beats. I dug them too, and joined the maniacs in the middle. We were on Istiklal, Istanbul’s biggest ped street and shopping district, and expensive stores lined both sides. Above us, people watched as they ate from balconies, and there were enough of them that the whole damn parade felt like an arena to display your insanity, or at least to tell people your insanity was normal. The crowd moved in packets, of about three hundred each, separating and melding with each other. I stuck with the samba band, and we stopped under a balcony by a really expensive mall, and yelled at the people sipping above. They looked down at us. I have no idea what they said. A slur, probably. Something clicked in the crowd and a few started yelling back angrily. A negative energy, added to the maniacle energy already there, infected my packet of people. Somebody charged the mall, with friends. More followed, faster. They were met with security guards with billy clubs, and the whole weight of the 300 person mob got swept up in it. I did too. It felt awesome as hell, I have to say, giving up better judgement and sticking it to the man. I felt their pain, to be sure, but most of it was just I was pissed because the crowd was pissed and we’d signed an unspoken contract to be pissed together. I joined the charge. A metal gate was lowered down, but the back of the crowd was throwing eggs and I was up front with a line of others kicking this metal gate for no particular reason as it came down. Even when it was down I gave it two or three more for good measure. It was a good, harmless target for our energy. We didn’t even scratch the thing. The whole fiasco stopped as soon as it started. The wise ones in the group set the pots back and everyone started dancing the samba again and I high fived somebody next to me and then we sprinted after the group in front, lest we brake the parade. We kept going to the bottom of the street, where there was kind of an enormous pride puddle, thousands pressed into a square, and they took out a rainbow flag so big that it was stretched from curb to curb and went a hundred feet down the street. Everyone ran underneath it, for no deeper reason that that is was a real ball. Then we all went to the square and people looked around excitedly. The energy had not left them, but they didn’t know what to do, so they just bounced around and said hi to each other with smiles. In the middle there was this tall wrought-iron tube, four feet wide and 60 feet high, and some guy on top waving the rainbow flag. Others were climbing up. He’d be a fine fellow to have in the story, I thought. I climbed up the metal tube and joined him. There were so many people on the thing that it wobbled, and it didn’t help that flag man wouldn’t stop bouncing up and down. I was scared to death but the fear didn’t have anything on the thrill. So I just sat up there and watched the teeming rainbow masses writhe. There was a huge smile on my face. I didn’t even get the flagman’s number, because he couldn’t understand what I was saying and we were both too pumped on adrenaline to listen. My brother and I got home an hour later and watched the footage. It was good and colorful. He got the charge on the mall and there I was, front and center, pushing up against guards and kicking the hell out of a metal barricade. I was so embarrassed I wanted to delete the footage right away, but he wouldn’t let me. The problem is that in joining the parade and losing myself in the insanity I had totally compromised any credibility I had as an impartial journalist. I had become part of the story, which is something that most journalists try to avoid. I can’t figure out if it was the right path, but I do know that this story is a hell of a lot more entertaining than any news report I could ever dream up. It’s a good angle, though, even though you may not actually be deliberate about it. No matter what, we fans got the Mea Culpa part; the stories are what we want. Just let them flow. This one was really fun, and the statement of the last three paragraphs took me out of it a bit. HOW DOES EVERYONE ELSE OUT THERE FEEL ABOUT IT!? Amazing story Morgan. I can’t begin to explain my jealousy as I’m finishing up my college degree, but keep them coming!